The bold beautiful aquamarine is one of the few stones that can be worn by every skin tone. It is also a very versatile stone. You can wear it with just about anything in your wardrobe. Whether it is a bight summer sundress or a warm winter scarf Apples of Gold's aquamarine art deco style ring is sure to match. The center stone measures 4mm and is surrounded by 42 white diamonds that are sprinkled in the 14K white gold setting. 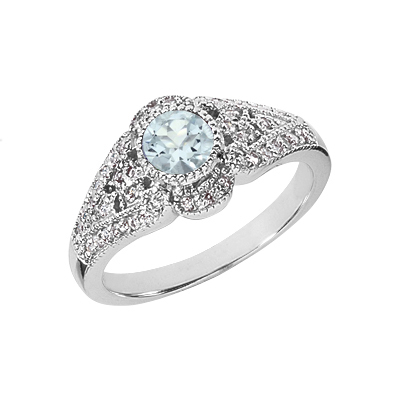 We guarantee our Diamond Art Deco Design Ring with Aquamarine Center Stone, 14K White Gold to be high quality, authentic jewelry, as described above.